Once they “understand” a topic or game completely, computers can calculate solutions with stunning speed, far faster than the wetware in our skulls. AlphaGo Zero, from British company DeepMind, accumulated experience by competing against itself millions of times to master the game Go and now exceeds the skills of the game's human experts. That's a remarkable achievement over the first version, AlphaGo, which had mined the data from numerous games played by people. But it was a limited accomplishment nonetheless, given that even the ancient game of Go has clear, finite rules. Babies, in contrast, rapidly adapt and learn how to manage in surroundings that are continuously changing and where the criteria for success in any endeavor (even for adults) are hardly ever clear. Their brains make predictions about what will happen in a situation, from patting a puppy to fitting a piece in a jigsaw puzzle. Then they experiment with their bodies and with objects, observing and analyzing the world around them. Millions of years of evolution have led to a superior learning system—one that today's roboticists hope to deploy to improve machines controlled by AI, or artificial intelligence. 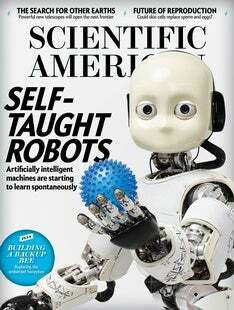 In our cover story, “Self-Taught Robots,” journalist Diana Kwon explores how programming algorithms to learn like children is both transforming robotics and providing some insights into child development. Read on to see what robotic “children” are teaching us adults. It's common to think of backup files for your laptop, but how about for pollinators? In “Building a Backup Bee,” author Paige Embry writes about how the world's largest almond grower is developing a replacement for honeybees called the blue orchard bee, or BOB. Honeybees have experienced devastating losses in recent years, having been victims of pests, disease, poor nutrition, pesticide exposure and the stresses of literally being trucked around to service different crops as they bloom. Unlike social honeybees, BOBs are solitary—and amazingly efficient. Assuming the challenges of making these insects into managed pollinators can be surmounted, a few hundred BOBs can do the work of 10,000 honeybees. Further adventures at the frontiers of science await: Read “The Baddest Bite,” by Gregory M. Erickson, for the secrets of the crocodiles and their relatives' evolutionary success. John Gabrieli provides “A Look Within” at imaging technologies that could find the best treatments for depression and addiction in our brains. “Island of Heavyweights,” by Christoph E. Düllmann and Michael Block, describes the race to find the world's heaviest elements—and the “island of stability” in chemistry, where novel elements could last for minutes or even years. We hope you enjoy the journey.